The initiative is part of the UK Government’s wider commitment to tackling the effects of the illegal trade in wildlife, and has been funded by the Department for Environment, Food and Rural Affairs (Defra). Its aim is to reduce the number of poaching incidents by providing training in proven interception tracking tactics, which will develop the rangers’ counter-poaching skills. The initiative replicates aspects of Tusk’s Counter Poaching Training Programme for Sub-Saharan Africa – also funded by the UK Government through the IWT Challenge Fund – which has been introducing these specialist interception tracking skills across 15 protected areas in sub-Saharan Africa, and combining this with improved information gathering and analysis, and the development of an information network. This has been led by Captain Luke Townsend following initial trial projects that were supported by the Prince of Wales’s Charitable Foundation, and which demonstrated the potential for the approach to make a significant difference. The British Army intiaitive got underway this summer. Soldiers were selected from a range of units according to their natural aptitude for tracking and flair for mentoring. As a result, the make-up of the team boasted a wide range of skills and experiences including infantry, armoured vehicle driving and engineering abilities. 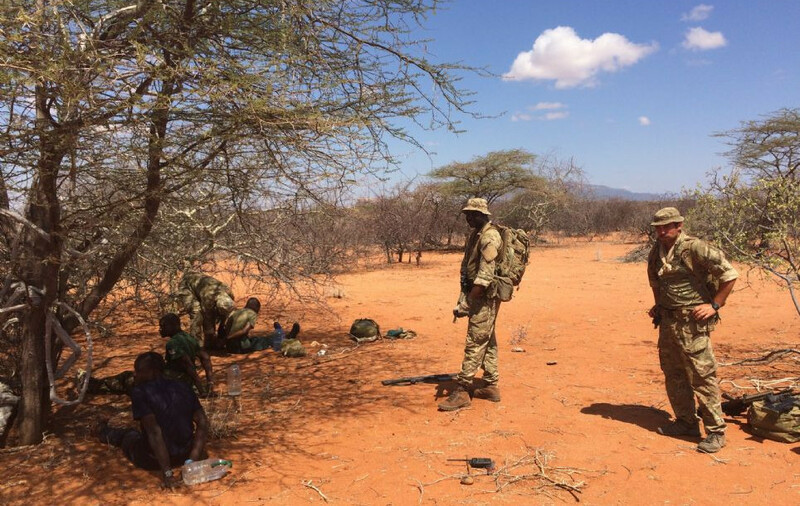 The soldiers were first trained in interception tracking and bushcraft skills in Kenya (pictured above during a training drill), by specialist trainers Simon Leak and Tom Fleetwood, who have previously trained rangers under the Counter Poaching Training Programme. In Liwonde National Park, the soldiers then worked side by side with teams from African Parks and the Malawian Department of National Parks and Wildlife to mentor the rangers. The partnership allowed both parties to hone and develop their skills, resulting in a much more effective, agile force capable of tracking both people and animals over a long distance. The UK soldiers have been able to learn and develop their own tracking skills, something the team do not get to practice in such terrain very often. The UK Operational Commander of the deployment, Major Tony Viney, described the three-man tracking groups as ‘ghosts in the park.’ Leaving a minimal trace on the ground and being able to cover vast areas, the patrols are a strong deterrent to any poacher considering entering the park. Working alongside the British soldiers, the rangers have improved their patrol techniques to better use their equipment and terrain. This includes lengthening their daily patrols and reducing the weight of their equipment by 30% so they can be more agile. With 548km2 of woodland and dry savannah to cover, the shift to these long-range patrols has paid off. During the three-month period, the teams removed 362 snare traps, two gin traps and more than 700 metres of illegal fishing nets the park. The rangers made 11 arrests, all of which have led to convictions, and nine poacher camps have been destroyed. There is no doubt that the joint team approach has made a positive impact on counter-poaching in Liwonde National Park.